"There is no place I would rather be right now", Alan voiced the thought we all shared while sitting around the campfire at 'Squall Meadows' after polishing off his scrumptious shrimp and veg noodle dish. We were still enjoying the box wine and Lava Sours. 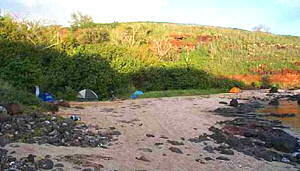 This was our second night camping, as we kayaked the south coast of Kauai; Bob and Dani had joined us that day making six and we were having a great time just relaxing by the fire after our leisurely morning paddle and even more laid-back afternoon, snacking and setting up camp. Four of us had begun early Friday morning, the last weekend of February, meeting at Honolulu airport for a 6:30 flight to Lihue. Everything ran smoothly, thanks to Alan's planning and a ride from our friend Bob, who graciously picked us up at the airport at 7:00 AM, and shuttled us to the market and the Young Bros pier! He and Dani were to join us the next morning along the way. So Jean, Chuck, Alan and I set off for the first day's paddle from Nawiliwili Harbor. We fought a little headwind getting out of the harbor but the run down the coast with a tailwind was spectacular and exciting. The cliffs begin right away and continue a few miles down the coast. We spread out a bit, as I like to poke along the shoreline while the others go out farther to fish. The cliffs drop sheer into the water with crashing breakers, so I couldn't get too close; there's no way to explore the tantalizing sea caves along the way, at least under these conditions. 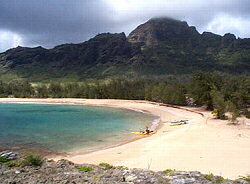 Just a few miles down the coast, there's a great place for a break, in a cove behind a small peninsula at Kipu Kai. The land is private and posted with signs above the beach, but it's a perfect spot to pull in and enjoy a stop, a very scenic little bay with a backdrop of green cliffs. February is a good time of year for this paddle as the lack of south swells makes for easier landings. Still, the campsite the first day is on a beach that looks closed-out on the approach, in Kawailoa Bay. There's surf off Pao`o Point upwind and only a narrow channel between the breakers, which we had to find after passing it downwind. Once on the beach, of course, and looking back, the route is obvious, 20/20 hindsight. There are people here but it's a day-use place primarily, so we had it to ourselves after sunset. It's an interesting place to explore as well, there's an archeological site inside a large "sinkhole"† at the south end of the beach. 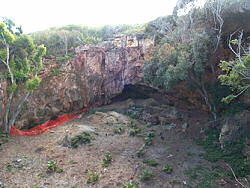 The walls of the sinkhole are sheer and the entrance through a low tunnel is blocked by a locked gate. 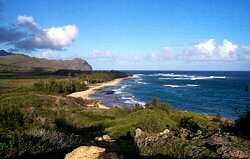 The next day's paddle is a nice downwind run past Poipu. 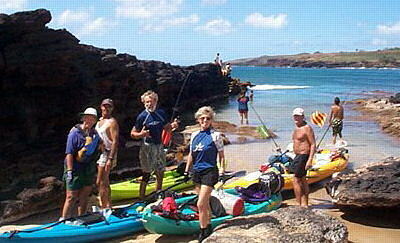 Just before the Spouting Horn, we pulled into the tiny harbor at Kukui`ula to meet Dani and Bob with their Malibu Two. They brought more beer and ice! From there, the six of us paddled to the Nomilu Fishpond inside a crater adjacent to the shore. The landing is in a tiny channel almost past the fishpond. It's a good place to land if there aren't too many boats or kids playing and if there's a little break between wave sets. Squall Meadows is just a half mile farther and has a bit of a tricky landing through a rocky intertidal zone. Once you're up on the beach, it's heavenly. The road access is only through the cane fields so it's rare to encounter other people there. It's a scenic little pocket beach with some trails to explore, but the main attractions are the beauty and isolation of the place. So Alan cooked and we made Lava Sours (secret recipe) and we partied!! What a way to spend a long weekend! The next day, Dani and Bob left us at Port Allen so they'd be ready for work the next day. 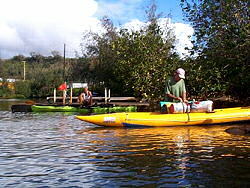 We paddled on to Waimea, where Waimea Canyon (the deepest canyon in the Pacific) was the backdrop for Jean and Chuck in their Big Aire. We landed at the Waimea Plantation cottages where we stayed the night and rearranged our gear to send home. Thanks again to our friend Kyle for picking us up and transporting us and our boats on the return. †Actually, it's a calcified sand dune - one of the largest on Kauai - that was eroded by seawater from underneath, then partially collapsed.